Historically black colleges and universities (HBCUs) all over the country are rejoicing because it’s finally February and Black Twitter is calling this their favorite month. It’s Black History Month! Students at Hampton University are using the month for the purpose it was created: celebrating us. To start off the month, Hampton held an opening ceremony to showcase untold stories of African-Americans throughout history. “Y’all love talking about Black Lives Matter, but what about our history? Do y’all know where we came from?” asked Kristopher Anderson, the host of the event and a senior sports manage-ment major from Atlanta. The event was a combination of skits about pioneers in black history such as Baby Esther Jones, the real Betty Boop, and Mo’ne Davis, the first African-American girl to earn a win and pitch a shutout in the Little League World Series. Students also performed spoken-word pieces, raps and dances showcasing African-American culture and what it means to them. For the rest of the month, there is an event nearly every day. The month’s theme on Hampton’s campus is Untold Stories of African-Americans. Some of the events are part of the State of the Black series discussing the black woman, black man, black church and black Greeks. There will also be a conference on the Art of Hip-Hop, a Black Panther movie screening and one of the most anticipated events, the Black History Extravaganza. At the Feb. 23 Black History Extravaganza, which is a valued tradition at Hampton, students come together to dance, sing, act and perform a combination of their talents. With so many events throughout the month, Hampton students can’t wait to show their love for February. 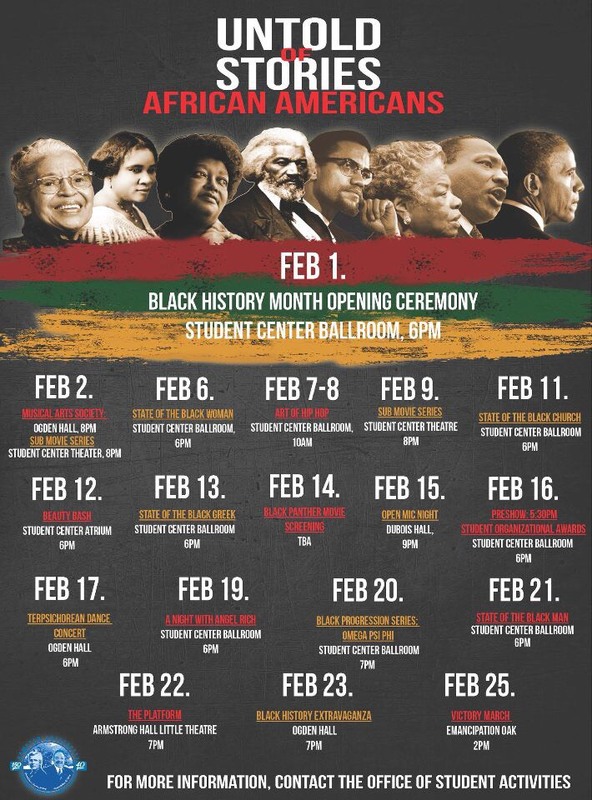 What’s your HBCU doing for Black History Month? Tell us with #BHMxHBCU.